Nick’s Picks is an ongoing series where Nick reviews comics and graphic novels. They’re usually not the very latest, but they’re always worth reading or discussing. Without getting too personal (that’s my old LiveJournal’s purpose), I struggle with situational depression. Most times, I’m a laid back, happy go lucky guy with a perchance for puns and getting excited for things like comics and yoga. When depression hits, though, I’m a a depressive, unsocial, sluggish hermit. I’d written a short story about my ongoing battle, which you can read here, if you’d like. It’s a subject that, more often than not, rears its ugly head in conversations. It’s not something I’m proud of, but it’s not something I’ll dismiss, either. It’s a large part of my life, whether I like it or not. 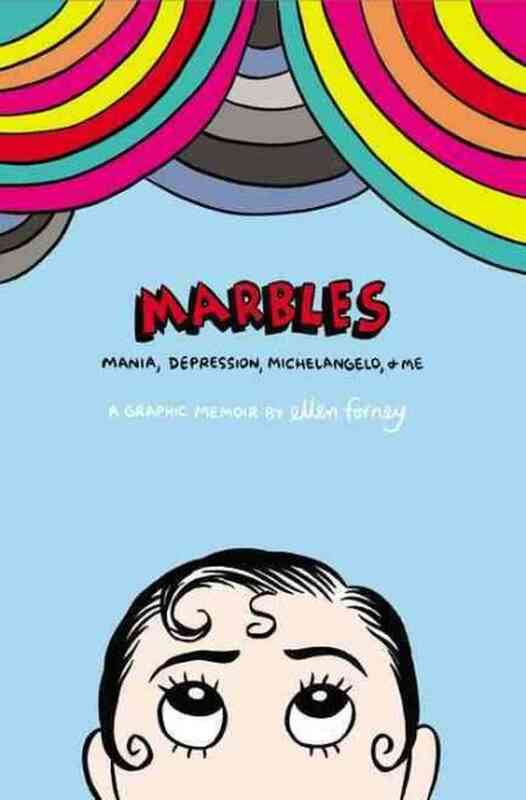 So when I saw Ellen Forney‘s Marbles, subtitled, “Mania, Depression, Michelangelo, and Me.” I knew I had to pick it up. I’m glad I did. Ellen’s openness and frankness about her ongoing struggle with bi-polar disorder is both enlightening and off-putting. To see someone write about something so very personal allows you to really get into their head and almost see how they think. By the end of Marbles, you really get a sense of what Ellen is like. She has this amazing ability to let you into her world and yet still leaves you wanting to know more. Make no mistake that this is a very personal memoir, one that could be off-putting for people who aren’t ready to jump into the world of mental illness. What makes this book doubly interesting for me is Ellen’s study of the link between mental illness and creativity. I can speak from personal experience that it’s near impossible to get any kind of creative endeavours accomplished while depressed. Calling this group the “Club van Gogh,” Ellen points out that many of the great writers, artists, and poets have struggled with a mental disorder – most commonly without any kind of medication. Her biggest, ongoing fear throughout the book is whether medication will hamper her creativity, which is also her big money maker. No artist wants to stop thinking creatively and Ellen is no different. Throughout the book, her therapist tries to find the right balance of medications. Anyone with a mental disorder can certainly relate to that struggle of finding the right medication that works for them. On top of that, Ellen also details the effects that each drug has on her, laying out both the positives and negatives. manic episodes, the pages become almost overly detailed, further showcasing her excitement. When Ellen depicts her excitement for something, the art follows suit. This is especially showcased when she talks about her back tattoo early in the book. Using idea bubbles, with one branching to another, we see her stream of consciousness in the tattoo’s creative process. I honestly found that part rather hard to read, which I think actually works in favour of those two pages. What I found equally interesting, though, is during Chapter 4, where she talks about he depressive episodes – my personal favourite chapter for obvious reasons. 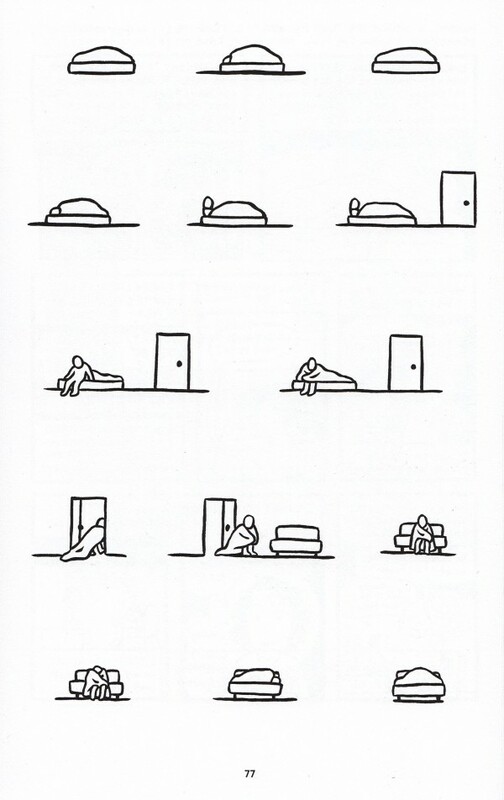 The opening page to the chapter is the most iconcographic work I’ve ever seen, depicting someone – anyone – struggling just to get out of bed, only to make it to the couch and continue sleeping there. It’s probably the one page that hit closest to home for me. The best example of the iconographic art allowing other parts of the book to shine is when Ellen shares with us various drawings from her sketchbook, each of which could easily have a place in a gallery on their own. Even better is when Ellen shows us “photos” from various events in her life. Any other artist would likely just copy and paste the photo onto the page. Instead, Ellen actually recreates the photo, putting a great deal of detail into the piece.They’re detailed enough that they stand out as photos, but still simplistic enough that they don’t get in the way of the flow of the book. As I said before, this book was a very personal read for me. Chapter 4’s depictions of depression hit incredibly close to home – especially as I’d just been recovering from a recent bout of depression, myself (only last week, as of this writing). I was glad to see Ellen referenced Feeling Good by David Burns because that book helped me through many tough times. She also referenced a couple of books written by authors suffering with depression that I’d honestly not heard of before: Darkness Visible by Willam Styron and An Unquiet Mind by Kay Redfield Jameson. At some point, I intend on checking both of them out. Honestly, I don’t know what else to say about Marbles. Anyone who struggles with a mental disorder should absolutely pick it up. Anyone who wants to understand what it’s like to struggle with a mental disorder should pick this up. Really, anyone who enjoys a great look into the mind of a creative thinker would enjoy this. I’m late getting this, but I’m glad I did. 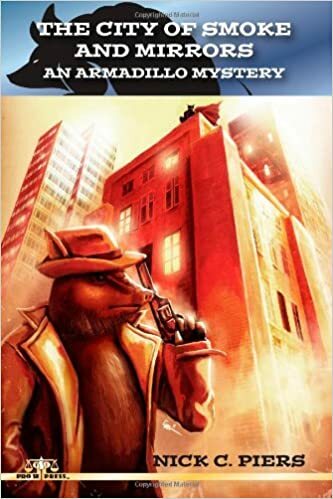 You can pick up a copy at your local comic store, book shops, or at Amazon. This entry was posted in Comic Books, Reviews and tagged comics, Nick's Picks. Bookmark the permalink.